Choosing the best t5 grow lights for a new marijuana growing project isn’t always easy; there are just so many things you need and things you want to consider when making a new purchase. So before you go out and buy your first t5 grow lights you want to think about the lamp that’s best for what you want to do. Hopefully this guide about T5 grow lights can help shed a little light on the topic. 1 What are T5 grow lights anyway? What are T5 grow lights anyway? First, what exactly are T5 grow lights anyway? 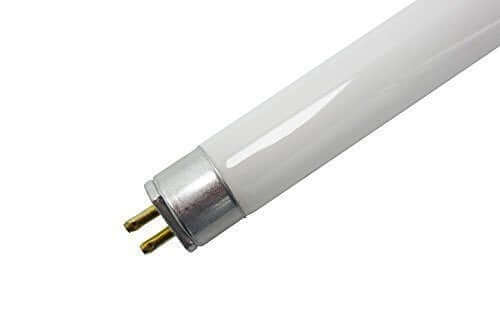 T5 is a size designation for fluorescent grow lights. They are “T” for “tubular” and “5” for 5/8-inch in diameter. They can be a variety of lengths, like 2 feet or 4 feet long. Their fixtures might weigh anywhere from under 10 to over 30 pounds. Most of the time the ballast is part of the lamp fixture so you don’t need to find a place for it somewhere else. Indoor growers appreciate T5 grow lights because they are less expensive than LEDs, they run cool so they can be suspended just a few inches above the plants, and they don’t use much electricity. If you get a chance to see some large weed growing operations, chances are you’ll see vertically stacked shelves of seedlings sprouting under T5 lamps. You may wonder how a blue-spectrum fluorescent bulb can grow anything at all. 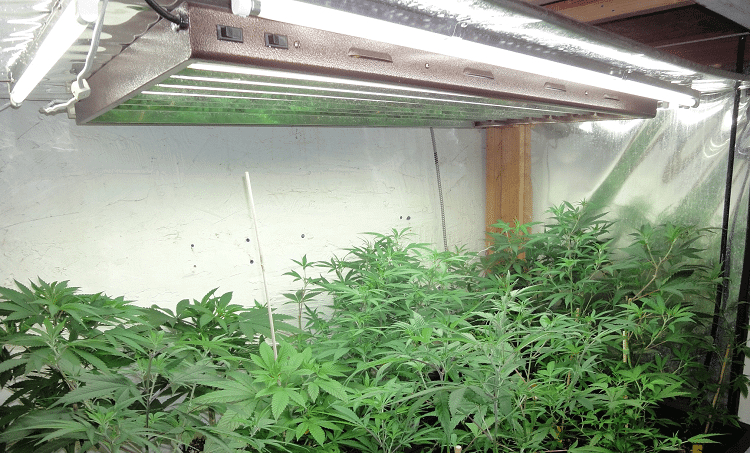 Believe it or not, weed growers have used fluorescent lamps successfully for a long time. Many old school horticulturists have T12 fixtures supplemented by high-pressure sodium lamps for the flowering stage. Unfortunately, the US government has forced T12 bulbs to be phased out and they’re hard to find. There are a few downsides to this kind of setup. If you choose to use T5, you’ll be smart to purchase additional red spectrum lights to help during the flowering stage. T5 grow lights alone won’t do much for your harvest. Plus, while T5 bulbs don’t degrade more than about 5% in efficiency over time, they only last about 20,000 hours, less than half the minimum of LED lamps. 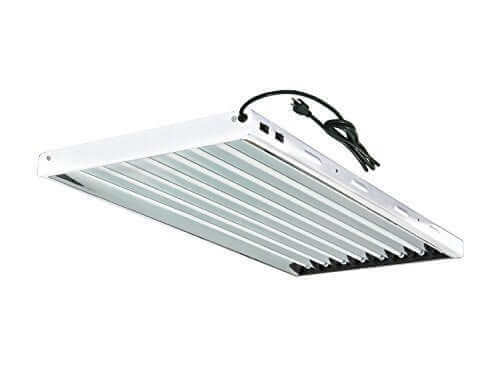 You’ll also need a ballast to run T5 grow lights, but most of the time that comes built into the fixture. If you want to sprout a lot of plants at once, T5 grow lights will save you money. They work well for raising cannabis up through the vegetation stage. Since they won’t burn the plants like hot high-pressure sodium lights, you can use a shorter grow tent. They are also helpful if you live in a warm climate because they add hardly any heat to your grow room. Now that we’ve covered what they are and what they can do, let’s take a look at the best T5 grow lights for growing cannabis. 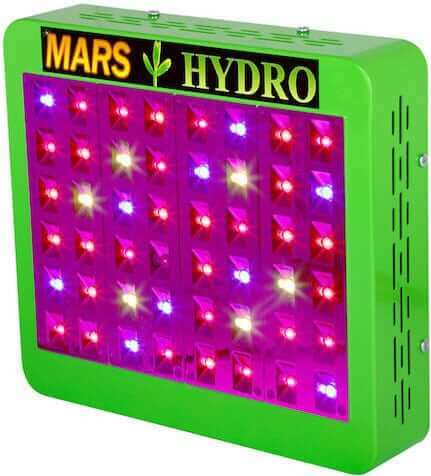 The Hydro Crunch offers 4 by 4-foot coverage with 54 watts output per bulb. It fits great in a small grow tent or closet. If you have a larger operation, the Hydro Crunch allows for a daisy chain installation so you can link up to three fixtures together to cover a larger room. You can also hang it vertically on a wall. The lamp configuration has a 95% reflective frame which intensifies the light output. 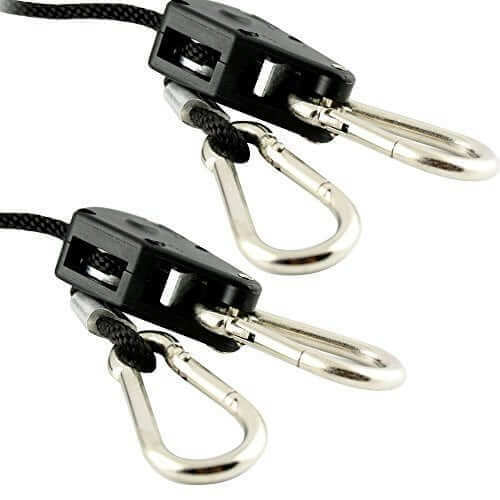 The lamp comes with a built-in hanging wire which allows for easy setup, pretty much a plug and go type of operation. The 15-foot-long power cord is UL-listed for safety but it isn’t compatible with GFCI outlets (like the ones in the bathroom with a reset button). This is a 4-foot long lamp like the Hydro Crunch. The system is made so that you can safely power up to 5 fixtures from a single outlet. The ballast is already included in the fixture. The setup comes pre-wired with a 15-foot long power cord and chains for hanging. You can vary the amount of light you want by using the switches to turn on just two of the four bulbs, or all four at once. DuroLux says that their German Hammertone Reflector helps this lamp put out up to 30% more light than competitors’ models. We weren’t able to test this claim ourselves, but various owners have commented that this is one bright light. If you’re a fan of Apollo Horticulture products, this small light fixture does not disappoint. It’s perfect in a small grow tent because it measures just 23 inches long by 12 inches wide by 2 inches thick. It comes with a 7.5-foot power cord and wire for hanging it vertically, horizontally, or overhead. 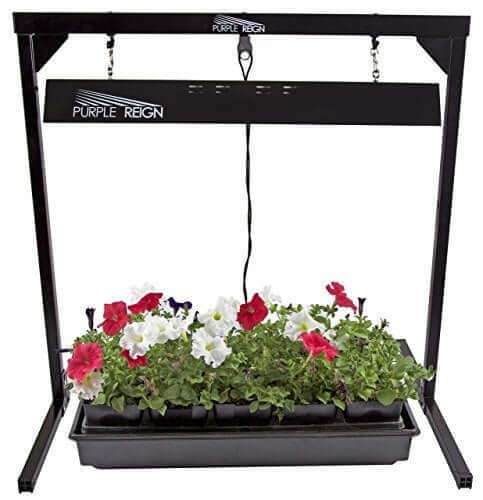 If you only have a couple of plants, the Purple Reign setup makes it simple for you. It comes with two 2-foot T5 bulbs that are 24 watts each. 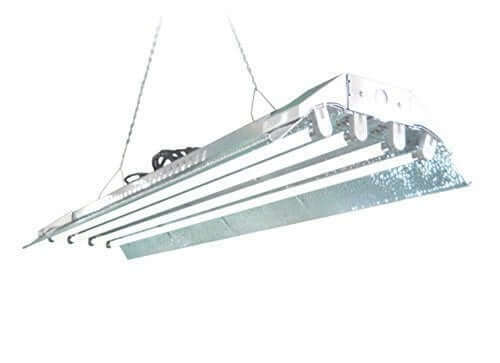 The frame suspends the light fixture so you can lower and raise it easily over your plants. Check out our Bulbs and Accessories sections below to see where you can buy a red bulb to include for flowering. Hydrofarm knocked the ball out of the park with the Agrobrite T5. You can check online and see that there are lots of happy owners growing healthy plants with this lamp. It’s 432 watts and 40,000 lumens of artificial sunlight. First off, Hydrofarm stands behind it with a 5-year warranty on the ballast and 1-year coverage against defects overall. Second, it has multiple on/off switches so you can control how many bulbs out of the eight total you want lit. It’s easy to swap out the bulbs if you want to add in red ones. Third, the lamp fixture is powder-coated so it looks nice and resists rust and scratches. Like the DuroLux lamp, this one has a highly-polished German aluminum reflector for maximum light output. You can hang it horizontally, vertically, or overhead. It measures 28 inches wide by 48.25 inches long by 4.25 inches thick. It comes with a ten-foot long power cord, which is the only disappointment (the other lamps above have longer cords). Do note that you’ll need your own chains to hang it and you can only daisy-chain up to two fixtures from a single outlet. 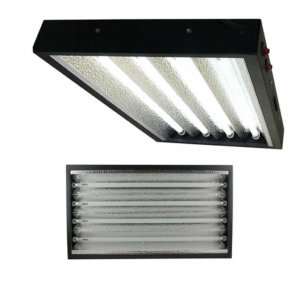 If you would prefer a smaller light, there is also a smaller Agrobrite with eight bulbs that are only two feet long. We mentioned that you’ll want red spectrum help for the flowering stage so we hunted down some ideas for you. 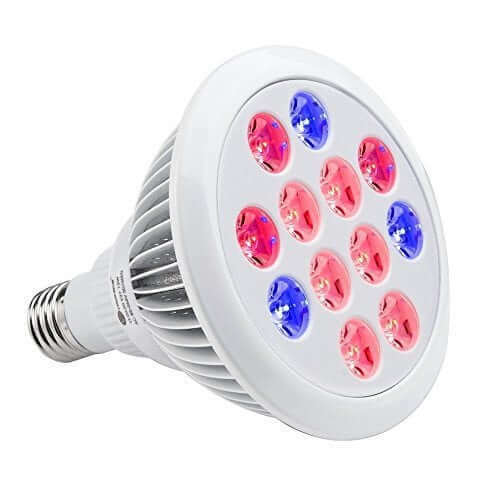 With a 2700K rating, these bulbs are red spectrum, perfect to swap into your T5 fixture for the flowering stage of cannabis growth. If you have a light with 4 to 8 bulbs, replace half with these. You can also add a second lamp fixture with just red on the wall and leave your blue lamp as it was overhead. 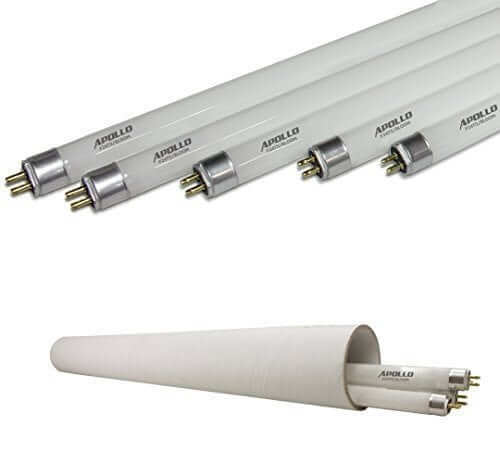 If you have a 2-foot long fixture, check out these red replacement bulbs from our old friend, Apollo Horticulture. And here are the four-foot-long 2700K bulbs from Apollo Horticulture. And sometimes you just need more regular T5 bulbs, so here they are. If your light fixture didn’t come with chains or wires to hang it, this adjustable hanger from Apollo Horticulture will save the day. Yep, we’re sneaking in an LED lamp here. If you have just one plant and want a cheap solution, this is it. You can also use it to supplement your 6400K T5 lamps. 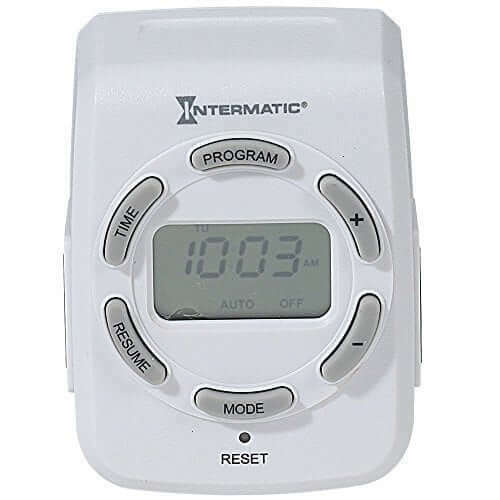 Intermatic solves the dilemma for you by offering two outlets on their digital timer. Now you can manage both red and blue lights at the same time in case you have them in separate fixtures. Q: I see 6400K and 6500K a lot on bulbs. What does that mean? A: That means those are daylight or blue-spectrum bulbs which are good for sprouting and vegetation stages of growth. 2700K or 3000K has the red spectrum which you need for the best flowering. K simply stands for Kelvin, a way to measure temperature color (and not just heat). Q: Wait a minute, how can 2700K be red when it’s labeled as “warm white” on the box? A: Sneaky, isn’t it? “Warm white” simply means it’s not that harsh blue color that regular T5 lamps give off. It may not look red, but the red is there. You can use a light meter to check it for yourself. Q: Which is better—LED, T5, or HID? A: We prefer LED lights most of all, but they are a big initial investment. Over time they literally pay for themselves because they don’t need replacement bulbs for years and they use very little electricity. Plus, you can get the whole spectrum of sunlight indoors with just one panel. You won’t need ballast, either. 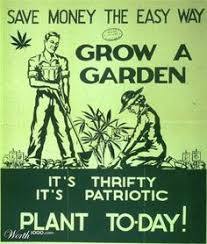 That said, T5 grow lights are an economical way to sprout seeds and start raising your cannabis. But they fall short when it comes to the flowering stage because you’ll need to supplement the bluish bulbs with some red ones to get the best harvest. On the other hand, they are less expensive for beginner growers. 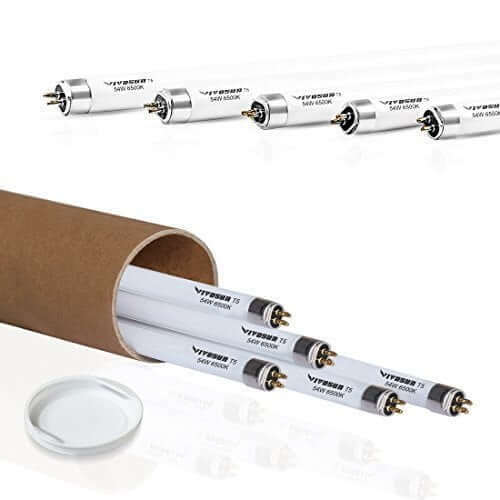 HID lamps like HPS (high-pressure sodium) have been a traditional tool of indoor growers but they are expensive, they run hot, and they use a lot of power. Q: You mentioned ballast. What is that? A: Ballast is an appliance you need to use with fluorescent (including T5) and HPS lamps because these kinds of lights would draw a lot of current all at once without it and burn out. They also flicker. The flickering may not be very noticeable to humans but it’s not great for growing plants. Q: Aren’t compact fluorescent lights (CFL) the same as T5 lamps? A: While T5 grow lights come with a reflector to send out as much light as possible, you’ll have to rig up a reflector for most CFL bulbs. They aren’t made especially for growing plants as much as for lighting up spaces for humans. Plus, you’ll have to figure out how to get CFLs close enough to your weed for best growth. Some of them get pretty hot and can burn a plant. Here are some things to consider before you buy a T5 setup. Before you purchase a fixture, find out how long of a power cord comes with it. Is it enough for your needs? How will you hang the light? Do you know where to buy replacement bulbs? Do you have red spectrum lights for flowering? We hope you got some helpful answers here in our review of T5 grow lights today. 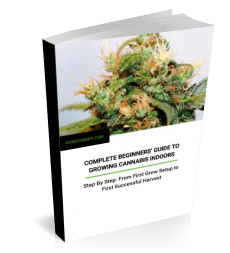 If you have questions about other aspects of growing marijuana, check out our free growing guide. If all this shopping is making you hungry, check out how to make munchies with cannabis oil. And if you’re curious about trying LED grow lights, just click the link for a roundup of LED lights for all budgets. 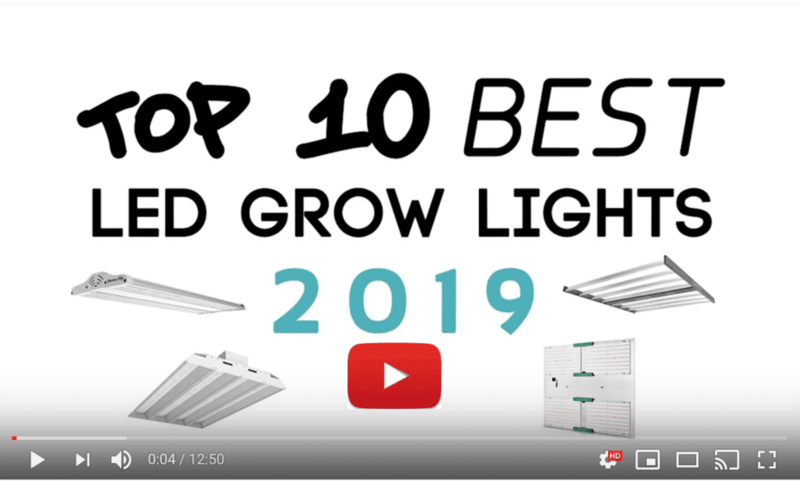 The best led grow light in 2018, high end quality on the market. 1) Samsung led chip, full spectrum , meanwell led driver, highest quality solution. 2) Waterproof, no fans, no noise. 3) With dimmer and timer, perfect for different stage of plant growing, you can choose the ” on ” and ” off ” time. 4) Cover the growing tent perfectly, the lighting is very even. Let me know if your show interesting it. Hi Tim, thanks for the info. Feel free to email us some more info at: maryjanefarmer@420beginner.com.